There has been a constant refrain that digital media is going to execute the very notion of print on paper since David Carson published his epic design treatise ‘The End of Print‘ in 1995. Yet we still read printed books, newspapers and enjoy holding a printed object. That wonderful feeling of being able to open a document, consume, annotate and discuss it with others is not going away. For us as an business who designs and prints a lot of long-form reports, the difference, the very survival of the medium is about specialness – it’s appearance and finish. We’ve been designing political reports for some years now, in particularly for the Parliamentary Advisory Policy Connect and it’s associated groups, and have always believed that they should stand out amid a torrent of other competing voices of supposed influence. Often these reports focus on matters fundamental to our national debate such as the future of education, health, sustainability or ways in which people can live in a safer way. But just because the information is intense and occasionally dry, it’s an even stronger argument for the layout to contradict that. With vital information, matters of the public interest and policy recommendations, clarity and authority is the first recourse. What goes hand in hand with that is impact. To launch a major report on policy or key findings of a major inquiry or event, attracting the attention of not only Parliamentarians but the media is key to its success. We’ve repeatedly worked to ensure our print reports look different from everything else and so instantly pop out as being something new, something important. Ensuring key messages are front and centre in a world with a tiny attention span has never been more important. But why does print matter? Because sometimes the physical object has more impact than it’s digital cousin ever could. 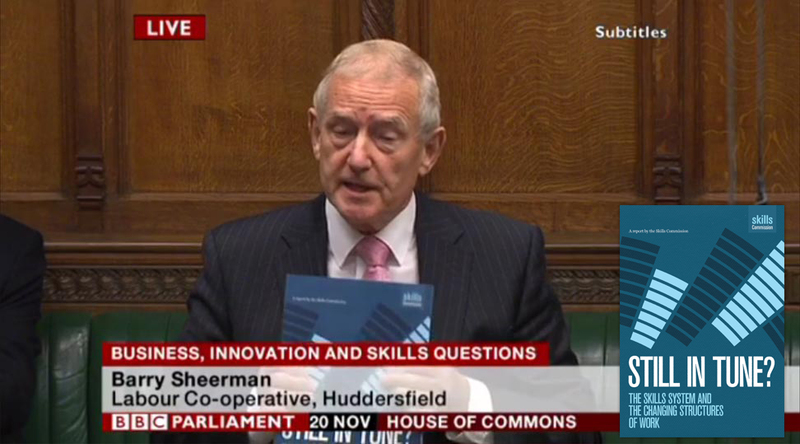 It’s not merely the ability to hold it up in the House of Commons (as Barry Sheerman MP did with our ‘Still in Tune?‘ report for the Skills Commission), but the ability to ‘whump’ it on a desk. And you can’t do that with a PDF. House style – followed or tuned up? Any organisation presenting an important document to the media usually need it to follow their brand guidelines. We’re very used to that and have worked in this way many times, it’s just a case of following instructions sensitively and then designing a document which remains eye-catching in that context. Some businesses prepare a more stringent set of rules than others which ultimately can affect the end product, but especially when preparing what can be part of an ongoing series of documents, consistency is all. Within this context, it’s important to know how far to push these rules, or how to use them and still design a print document which stands out and looks distinctive. Any organisation investing in a major piece of print design is going to want their latest piece of research or set of findings to stand apart and look fresh and up to date. These changes can be as simple as the choice of a fantastic cover photograph, or be helped by a snappy title enabling a slightly bolder use of type. At the end of the day, these sorts of simple approaches on the outside of the document can be fundamental to the success of what’s inside it. We’re also approached regularly to design documents which need to completely stand out from all that went before. This usually means retaining the brand identity of the parent organisation but, particularly for a stand-alone document, designing something very distinctive. An interesting side benefit of this sort of approach can be that following a successful ‘tune up’ of the overall design approach for one project, other elements of the brand such as a corporate brochure or website design can follow suit. It’s been a successful approach we’ve seen time and time again. We’ve designed many reports for organisations who have to focus on Parliamentary advisory, but this of course comes in many shades and of course includes lobbying. Professionally produced documents which focus on the advantages of changing policy to suit a particular industry are not by their nature specifically based on findings or research but can still be relevant and valuable. This is particularly the case as an organisation may be able to lend counsel based on particular areas of expertise. A good example of this is the work we’ve completed for Rail Delivery Group, particularly focusing on the future of the rail industry and the economic benefits of investing in freight to the UK economy. These forward-thinking documents are business and industry-focussed but clearly are a topic for major discussion in Government. So the overall look of the layout tends to resemble less a dry policy paper and more the kind of visual appeal one might associate with an annual report or corporate brochure. The success of documents of this kind tends to be associated with an understanding of the audience. When combined successfully, a common visual and verbal language can be particularly persuasive. For instance, in particular reports which are particularly related towards planning of spending for the future, we would recommend a tone of authority as well as aspiration. This would then be backed up with clear, typography and a choice of imagery and visual approach which give an air of modernity and reliability. The end result is a printed piece which is persuasive and powerful – and well worth the investment. Upon completion, we always produce two kinds of digital files at the end of a major piece of print design work. The first is usually the artwork which is supplied to our printer for offset litho printing. Either stitched or case bound, the end result tends to be cool, clean and invariably gives the document significant gravitas – the ‘whump factor’ discussed above. The second is the electronic version. With so many different devices going around, we’ve had to change our approach for designing all forms of report as invariably a ‘magazine’ type layout of double page spread just isn’t practical when supplying downloadable files for the web. Our new-style PDFs are designed to work either in a to-be-expected office printer format, or increasingly, to work with tablet browsing as part of an organisation’s e-Library. This means the document can be read as an ongoing resource as well as being found using search engines giving the document an ongoing life and influence significantly beyond its publication and launch. A great example of this is the work we completed for the MS Society which remains a standard document issued to hospitals, surgeries and other medical facilities, but remains a quick download from their website.